Anonymous communication platforms and the pre-teen-to-teenage brain are two things that don’t mix all that well. Just look at Ask.fm, for example, the social Q&A platform whose shield of anonymity led to cyberbullying that was later cited as a contributing factor in well over half a dozen suicides. But it doesn’t have to be this way. The founders of an up-and-coming anonymous messaging app called Yik Yak, that began to take off among the middle school and high school crowd where it has been linked to both bullying and threats, have taken the unprecedented step of actually blocking younger users from accessing its application while on school grounds. Yik Yak was launched by two Furman University students, Tyler Droll and Brooks Buffington, as something of a hyperlocal Twitter aimed at college students. Students could post about campus happenings and events, voice complaints, share news, and, at least in one case, update fellow classmates about weather-related closings when an official alert system had failed. The platform, which connects nearby users automatically, doesn’t require that people identify themselves by name, but instead allows users to post anonymously or use an alias. Initially, the company introduced the app at southeastern college campuses in the U.S., but it later spread through word-of-mouth to other universities across the country, and then down to both high schools and middle schools. I’d say it was far worse than that, with posts that, for example, actually saw some students bullying a girl for getting raped. In another case, an Alabama teen was arrested after threatening to shoot someone via a post on Yik Yak. And then there were the anonymous bomb threats, which saw schools going on lockdown. The company began to realize the severity of the problem as the app was banned at a number schools, and even became the subject of police investigations. “In a small handful of cases – probably three or four – we dealt with local authorities in terms of threats that have been issued on Yik Yak…A few of them actually resulted in arrests,” Buffington tells us. “Anonymity is a great thing – the whole reason why we made it is because when you’re anonymous, no one can judge you. But you can’t yell ‘fire’ in a crowded theater. There’s a line to be drawn,” he says. Buffington claims the company hadn’t been keeping exact track of how many times Yik Yak was referenced in terms of being the cause of bullying, threats or other complaints. But the startup was well aware of the general problem, if caught a little off-guard. “We definitely didn’t expect it to take off on high school campuses like it has,” he says, noting that the app already had a 17-plus rating on the App Store, so parents could easily block it on kids’ phones. But user ratings are not enough, says Anna Mendez, Executive Director at the National Association of People Against Bullying, explaining that Apple’s system requires parental involvement, and is difficult to use. Her organization reached out to Yik Yak following the bomb threat at San Clemente High School, asking the company to disable the app at middle and high schools, where anonymous applications are likely to be abused. “Certain things should always be kept out of children’s hands,” Mendez tells TechCrunch. “Kids are at a different developmental level than adults. Physically, the frontal lobes of their brains aren’t fully developed. That’s the part of their brain that helps them recognize future consequences from current actions. At the same time, their hormone levels are escalating. Middle school and high school are some of the toughest years where kids begin having self doubts and bullying starts becoming more violent,” she says. 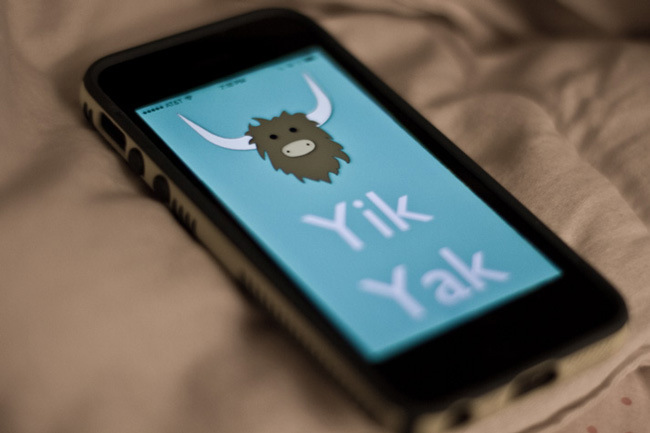 Yik Yak Blocks Access To Students Across The U.S. So the team at Yik Yak came up with a technological, and rather creative, solution: block younger students from using the application by way of geo-fencing. Initially, these were handled on a one-off basis, as was the case in Chicago, where the app was blocked at area schools. To implement these same sorts of bans nationwide, the team approached third-party data provider Maponics in order to license GPS data for a total of 100,599 public schools across the U.S. as well as 28,111 private schools. Maponics tells us this is the first time their data has ever been used to help a company exclude traffic across such a wide scope. Typically, their GPS data is used for targeting purposes, not blocking. As of early this morning, Yik Yak has applied the Maponics-based geo-fences across the U.S., and says that now the app is inaccessible on a large majority of U.S. high school and middle school campuses. “If for some reason the app is still accessible on a school’s grounds, all they need do is email us at yikyakapp@gmail.com and we’ll look into it ASAP,” notes Buffington. At the end of the day, the company says the goal is making a sustainable product. “We want to make sure that, two years down the line, Yik Yak is what you use when you’re in a new location – it’s what you pull up to see what’s going on around you,” says Buffington. Though it’s fair to say that Yik Yak should have considered the ramifications of releasing an anonymous, social application into the wild in a post-Ask.fm era, it’s also good to see they’ve fairly quickly addressed the problem, even if it cuts off the second-largest group of users on its service. (College students are the largest, of course). “Most [startups] are concerned about grow, grow, grow, grow. We want to grow and we want to be huge, but we also want to make sure that we’re creating sustainable, good communities, too. That’s number one our list. We didn’t create Yik Yak so that people could target other individuals,” says Buffington. Now it’s time to see how addicted, or fickle, Yik Yak’s newly blocked students are, and whether or not they’ll turn to the next soon-to-be launched anonymous social application to fill the void.